How Should I Clean My Dental Braces? That's a very good question, which is close to my heart because I'm currently wearing braces, too! Dr. Sharma, Orthodontist says, "When you have braces it’s very important to brush your teeth after every meal. Why? 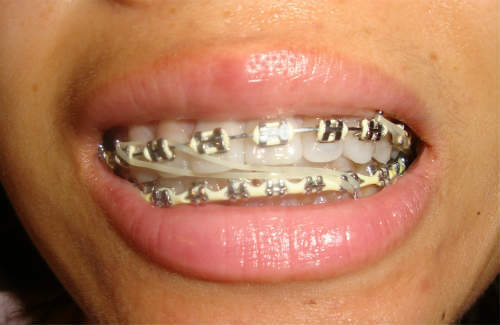 Because wearing braces can give food particles and bacteria extra spaces to hide and thrive." I use a five step process that many people may find intense, but I've grown used to it. And you will, too. The reason I have 5-steps is because braces are a BIG investment. I don't want little critters leaving behind cavities, or worse, uneven color (discoloration) to ruin my nearly two year commitment to improve and realign my smile... which will help me keep my natural teeth into old age. If you're intimidated, don't be. You'll get used to it. Besides, I don't go through each step everyday, especially step #5. But some steps I do do more than once a day, like steps #2 and #3. Step #1: The Waterpik - The perfect way to flush out the deep corners and crevasses created with dental braces. The waterpik is the best way I've found to sweep away food particles and other debris hiding deeply and clinging to your braces. You can control the water pressure shooting out the pick and can aim it squarely on the secret hiding places only you know. A fun experiment to try is brushing your teeth first, then swishing and rinsing your mouth ferociously until nothing falls out, AND THEN use the waterpik. I bet you'll be shocked by how much more gunk spills out of your mouth. Yuk. Step #2: Flossing - How do you get around all those pointy wires? This is really mission impossible without the right tools. On the other hand, I religiously floss after each meal whether at home or on the road. The first works like threading a needle. The thread being the dental floss. Once you thread the floss past your braces and through your teeth you can floss like normal. I prefer the needle-thread tool because I feel it wastes less material. The second type of special braces flossing tool has a flat profile so it slips past your braces and allows you to floss between your teeth. This is a pretty clever design. 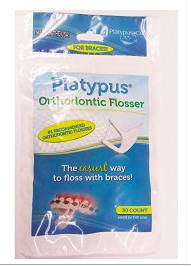 It comes with floss already installed and is therefore disposable after one use. Even though I prefer the threader style, I carry a baggy with a few flat profile flossers in my purse. This allows me to floss after a meal when I'm away from home or the lab. Luckily, you can use a normal soft bristle brush with your braces. But on the road I carry disposable brushes that let me slip into the lady's room and sweep away any embarrassing food stuck to my braces. The disposable option is not designed to give you a proper brushing, though. It's a temporary maintenance measure to remove big, obvious, and embarrassing food goo out of plain sight! At home, however, we are true believers of the mechanical tooth brush. My kids haven't had a cavity in years. 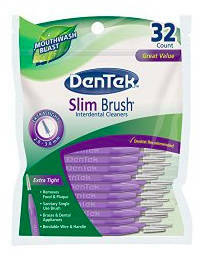 After each meal I brush with this or with a normal soft bristle tooth brush and do a proper job. After I've cleaned away all the detritus-nasties, I like to seal in the goodness with a fluoride, non-alcohol mouth rinse. A mouth rinse like this isn't just for good breath, it's very helpful to strengthen your enamel. By the way, if you suffer from tooth sensitivity you may want to try rinsing with a fluoride mouth rinse. My husband notices that his teeth are not sensitive to cold foods like they used to be since rinsing. We use the #1 Dentist Recommended Act. Get regular check-ups with your dentist. Enough said. In addition to keeping your orthodontics appointments go see your dentist. They don't do the same kind of work, and you really want them working together to keep you smile healthy and strong. We go about every six months. The good news is that when you keep your teeth and gums healthy, seeing the dentist is affordable and pleasant. I hope my 5-Step Dental Braces Cleaning Process helps keep your braces in tip-top shape! What are Dental Discount Plans and can they Help You? Home > Ask Your Questions > How do I clean my dental braces?